The Russian foreign minister reiterated Moscow’s position that the international community must make up its mind and take one side in the settlement of the Syrian conflict. Russian Foreign Minister Sergei Lavrov has called a US State Department report that Russia, the US and UN agreed that Syrian authorities should pass their power to a transitional government as a “strong distortion of information”. The top Russian diplomat commented on the statement made earlier this week by the Department of State spokeswoman Jen Psaki. “In particular, the State Department representative stated that Russia, the United States and the United Nations agree that the goal of the new conference in Geneva must be the forming of a new transitional government in Syria. This really matches with what was written down last year. But, if the reports that I have received are true, the State Department went on to add that this should be a transitional government to which the current authorities in Damascus would hand over all their powers. If this was really said by the State Department, this is a very strong distortion of what the talks were about,” Lavrov told reporters at the press conference connected with the Baltic States’ conference of foreign ministers. The Russian Foreign Minister said the agreement reached at his meeting with Secretary of State John Kerry was that the “forming of a government on the basis of consent between the authorities and the opposition is one thing and forming it through handing over the power from the government to the opposition – is something completely different. "Therefore, I expect that the US negotiators will observe what we have agreed upon with John Kerry,” he noted. The official reiterated the Russian position that the international community must make up its mind and take one side in the settlement of the Syrian conflict – either with those who insist on regime change or with those who press for internal dialogue. Lavrov said that the first option was a direct path to violence and it did not promote the interests of the Syrian people. Sergei Lavrov emphasized that the current analysis showed that everything was interconnected within the so called “Arab Spring”. Russia insists that the forthcoming Geneva-2 conference united all countries that could potentially influence the situation, including Iran. “Our partners are using quite strong expressions when they speak against the Iranian presence. 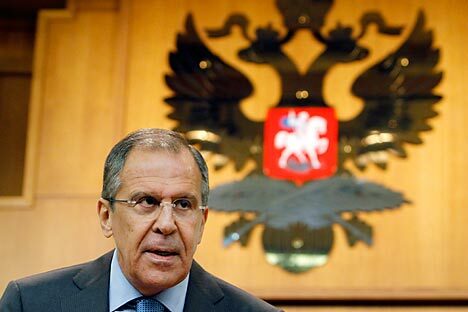 We consider it a mistake,” Lavrov said. The head of the Russian Foreign Ministry asked the Turkish authorities to provide information about the detention of Syrian rebels who had in their possession chemical weapons, such as sarin nerve gas. “We would like to bring clarity in all questions because the chemical weapons issue becomes a basis of speculation and provocation. I would not exclude that someone wants to use it and claim that the “red line” has been crossed and the military intervention from abroad is necessary,” the official told reporters. Earlier this week the French and British governments said that their experts completed investigations into alleged chemical attacks in Syria and came to the conclusion that the attacks were true and that the Damascus authorities should be blamed for at least one such attack. Russia insists that the probe must be conducted by an impartial body, such as the UN, but recently a top Russian diplomat admitted that under current conditions the hopes for a speedy and unbiased probe were slim.